The ultimate measure of success in education is not whether or not children attend school, but whether they learn. And creating a system in which learning is valued requires finding out what children are learning and building broad awareness about it. It was these two principles that inspired the organization Pratham in India to mobilize and train volunteers to conduct household surveys of children’s learning. Since 2005, Pratham’s Annual Status of Education Report (ASER, which means “impact,” for short), has provided estimates of reading and math abilities—the fundamental building blocks for more advanced skills—for children aged six to sixteen in every rural district, aggregated for every state and for India as a whole. What’s more, Pratham’s pathbreaking efforts have inspired similar assessment efforts in nine other countries across the developing world. This is a growing movement that my colleague Ruth Levine and I have written about before. The Hewlett Foundation has supported citizen-led assessments since the early days of our Quality Education in Developing Countries initiative—part and parcel of our strategy to place learning at the center of the definition of success in education. By involving citizens in an assessment simple enough to be understandable by even illiterate parents, a broadly shared picture of progress in improving education, from the household to the national level, has emerged. This process has fostered the transparency, accountability, and participation in education that lies at the heart of our next phase of work in international education. Given the centrality of this work to our past and future strategies, the Foundation commissioned an evaluation to better understand the extent to which citizen-led assessments have been successful in their aims. Have citizen-led assessments succeeded in building awareness of the learning crisis? Moreover, has assessment translated into meaningful actions that will ensure more children are mastering the basic skills they need to succeed later in school and in life? The full report on the findings from that evaluation, conducted by Results for Development, is worth a read—both by those who are engaged in efforts to improve learning and by those who are interested in harnessing data and engaging citizens to enhance government accountability. 1.Thanks to citizen-led assessments, education debates are now focused on learning. Citizen-led assessments are by no means the first efforts to measure learning. They are, however, the first efforts to measure foundational skills of reading and math independently and at scale. Before ASER came along, the global community did not know just how many children were failing to learn even the most basic skills. Shockingly dismal results—like the fact that half of Indian fifth graders are unable to read—demonstrated in stark terms that challenges in learning are pervasive and start early. This wake-up call contributed to a shift in discourse within countries and internationally. In Kenya, for example, the latest education sector plan cites the Uwezo assessment findings and includes a central emphasis on improving learning outcomes. Globally, deliberations on setting the Sustainable Development Goals are headed towards a goal for education that focuses on ensuring inclusive and equitable quality education and lifelong learning for all. Citizen-led assessments are changing the debate about education. First, focusing on ensuring that children are mastering foundational skills and are doing so early in their education is critical. If we continue to leave children behind on these skills they will not have a fair shot at developing other deeper learning skills that are critical for their life chances. Second, the evaluation results show that citizens can be reliable data collectors. Citizens can play a central role in monitoring whether their governments are making progress against their development goals. The third and final insight is that learning assessment can be done meaningfully and affordably. The evaluation also tells us that even simple assessments provide reliable estimates of skills that matter—and they reveal whether goals of inclusion and equity are being met better than school-based assessments, which fail to capture children who drop out, attend irregularly, and/or attend informal schools. And they do all this at a fraction of the cost of other assessments, providing a clear model of the kind of meaningful, affordable monitoring mechanisms that will be needed for the new Sustainable Development Goals. 3.There are several avenues for citizen-led assessments to explore that may help to deepen their impact and influence. Although citizen-led assessments have had a tremendous influence on the education debate, they have not resulted in widespread, effective action for learning improvement. The evaluation provides a road map for how these assessment efforts can intensify their impact in the years ahead. Recommendations to improve quality, including the comparability of the findings across time and languages, have already been taken onboard. Experiments are also underway to extend the roles of volunteers and partner organizations to try to more effectively stimulate actions by citizens and governments that improve learning. Insights about the ways in which information on social service outcomes can drive social accountability stands to benefit not only the growing family of citizen-led assessments, but also the broader field of transparency and accountability. 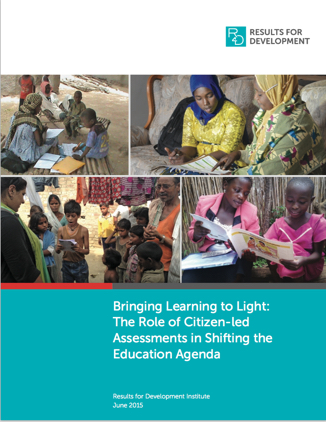 Citizen-led assessment have accomplished tremendous progress in putting learning at the center of education. The results of this evaluation are well timed to help inform the current and growing members of the newly-established People’s Action for Learning Network—which provides a platform for organizations to continue learning from each other, to draw on joint resources and expertise for improvement over time, and to nurture organizations who are interested in undertaking similar work—to iterate on a powerful design and move towards even greater progress. UPDATE: The UNESCO Institute of Statistics, , a grantee of our Global Development and Population Program, recently took the initiative to translate this post into Spanish. Thanks to Alejandra Masa López and Ana Aznar Castillo of Spain’s Instituto Nacional de Evaluacíon Educativa (INEE) for their work on the translation.